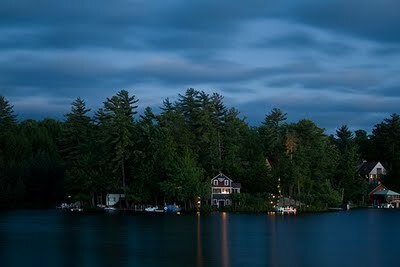 We are leaving for a quiet week at a rustic cabin on one of the Adirondack lakes in upstate NY. After a frenzied week of tackling the tasks list, I'm looking forward to sitting on the dock, reading through a pile of magazines and catalogs and books, paddling in the canoe, maybe making some recipes for the family from farmstand offerings, and taking some photos. And writing. Oh, writing, I'm missing you. Hopefully I can revive my writing brain soon. we all liked the movie Bandslam; pretty good for a teen musical. Surprisingly so, since the ads make it look like High School Musical 5. It is reminiscent of the John Cusack movies of the 80s, I thought. Just got Pat Conroy's new novel, South of Broad, just in time to take with me to the cabin. Can't wait. Also taking up a bit of my brain bandwidth: trying to make some decisions. Dear Mr. Frost, What happens when five roads diverge in a yellow wood? What then? Huh? I stink at decision making. Tagged with adventures, summer, vacation. August 22, 2009 by Anne.